Our digestive system uses powerful detergents to break up the fat in our diet and make it available to our cells. These detergents are built from cholesterol, which is normally quite insoluble in water and is found in membranes. To turn it into a detergent, several solubilizing groups are added, including hydroxyl groups on the main cholesterol ring structure and the amino acids glycine and taurine on the cholesterol tail. The result is a bile salt (shown here on the left), which is soluble in water, but also has a carbon-rich side that interacts strongly with fats. Bile acids are toxic to some bacteria and help to define the normal bacterial flora of the small intestine. Some bacteria have evolved the means to modify these bile acids by removing amino acid conjugates and performing various redox reactions, creating "secondary" bile acids. 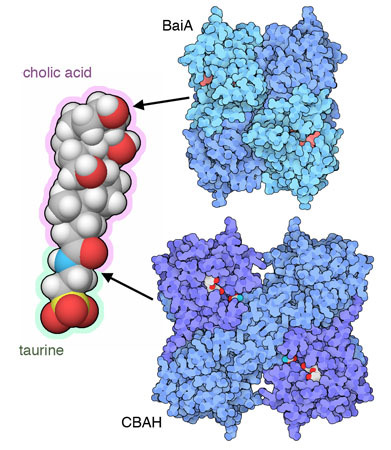 The structure shown at the bottom, from PDB entry 2bjf, captures a conjugated bile acid hydrolase (CBAH) just after it has removed taurine amino acid from a cholic acid bile salt. Only a few types of bacteria, however, have the molecular tools to attack the hydroxyl groups. PSI researchers at JCSG have revealed the first structure of one of these enzymes, shown here at the top from PDB entry 4is3. BaiA begins the process by removing a hydrogen atom from the cholic acid hydroxyl group. 95% of bile acids, both the original primary forms and the modified secondary forms, are absorbed back into the body and recycled. This leads to exposure of the liver and other parts of the body to these bacterial molecules, which can lead to problems such as the production of gall stones. Surprisingly, these molecules also act in cell signaling pathways and effect gene expression patterns, and have been implicated in diseases such as cancer. Our own cells put just as much work into building bile salts as bacteria do in destroying them. Seventeen enzymes work together to convert cholesterol into a variety of different bile salts, with different shapes, hydroxyl groups, and attached amino acids. The enzyme shown here, solved by PSI researchers at SGC (PDB entry 3v8d), performs one of the first steps, where a hydroxyl group is added. The enzyme uses a heme group as a cofactor to assist with this tricky reaction. 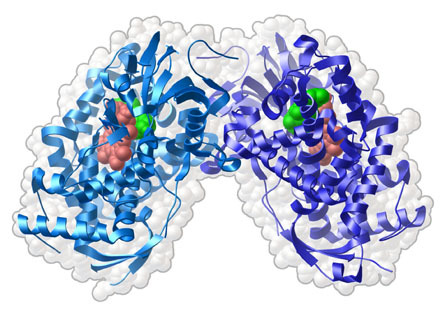 The structure of BaiA reveals the details of the enzyme active site. These types of dehydrogenase enzymes typically require either NADH or NADPH as a cofactor. The structure was solved with NADH in the active site, and PSI researchers found a glutamate amino acid (yellow) perfectly placed to block binding of the extra phosphate group found in NADPH. 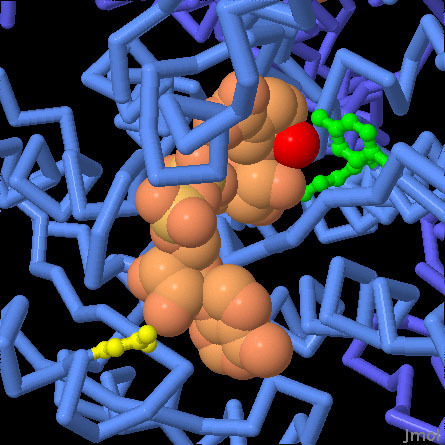 Analysis of the structure also identified a hydroxyl ion (red) and two key amino acids (green) that may be important in the hydride transfer reaction. To look more closely at the BaiA active site, the JSmol tab below displays an interactive JSmol. This structure of BaiA includes the NADH cofactor (orange) and a hydroxyl group (red). Several amino acids are important in the reaction, including a glutamate that provides specificity for NADH (yellow) and a tyrosine and lysine involved in the hydride transfer reaction (green). Use the buttons to change the representation of the molecules and to view the entire enzyme complex. Bhowmik, S. et al. Structural and functional characterization of BaiA, an enzyme involved in secondary bile acid synthesis in human gut microbe. Proteins, in press. Rossocha, M., Schultz-Heienbrok, R., von Moeller, H., Coleman, J. P. & Saenger, W. Conjugated bile acid hydrolase is a tetrameric N-terminal thiol hydrolase with specific recognition of its cholyl but not of its tauryl product. Biochem. 44, 5739- 5748.